Everything you need to know about American gold eagles. Many countries now issue a one ounce bullion coin, to be sold at a very low premium over the intrinsic gold value. The American version is the Eagle. Because krugerrands were the first one ounce gold bullion coins to be issued, it is worth comparing gold eagles with krugers. Krugerrands were first issued in 1967, as one ounce bullion coins. From 1980, they were also produced in fractional sizes of half ounce, quarter ounce, and tenth ounce. Eagles were introduced in 1986, in all four weights except the quarter ounce which was not introduced until 1987. 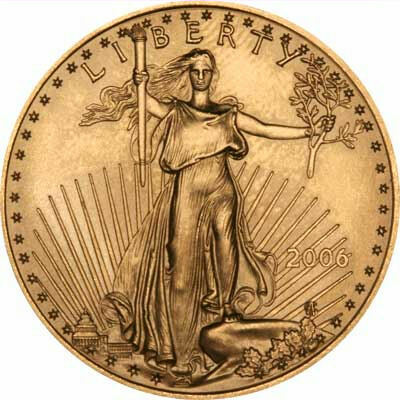 On the earlier bullion eagles, from 1986 to 1991, the date is shown in Roman numerals, from 1992 it is in Arabic numerals. We have pictures of the two different types on our Latin Dates on Eagles page. While krugerrands must be one of the least attractive coins issued, eagles must rank amongst the most beautiful! Gold Eagles are available in four different sizes and weights, from one ounce to one tenth of an ounce, as detailed below. 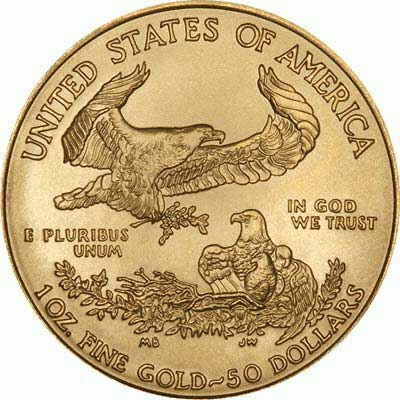 Eagles were originally $10 gold coins, double eagles were $20, while half eagles and quarter eagles were $5 and $212 respectively. When the USA introduced a series of gold bullion coins, it was natural to continue the eagle tradition. All sizes feature a magnificent portrait of Liberty standing. The reverse shows an eagle landing in its nest. The 1/12th of the alloy, or 8.33%, which is not gold, is 5.33% copper and 3% silver. Diameter = Diameter in millimetres. Because of EU reprisals against selective US import duties on steel and other goods, there was, during much of 2004, a surcharge of up to 17% on the import of many American items, including US gold eagles. At the time, until those taxes were cancelled, we could not easily import new US gold eagles, and temporarily stopped offering them for sale. This punitive tax has now been removed, but we have left this paragraph here for information. Gold bullion prices fluctuate constantly. We don't try to maintain a current price quotation on our website. Please contact us if you wish to buy or sell eagles.